Muhammad Hafeez who is currently playing against New Zealand will retire after this test series from the test format of cricket. After a staggering performance in the recent test series, Muhammad Hafeez finally decided to retire from test cricket. 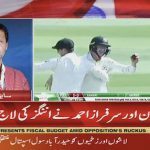 The decision came when Pakistan is playing against New Zealand and by winning the final test match, Pakistan could win the series. Muhammad Hafeed in his test career played 203 matches, scoring 6153 runs, with 140 being his highest test score. Hafeez has always been a threat for the opponent with his bowling more than bat. But recently his bowling action came under scrutiny which also kept him out of action. Hafeez is still part of the One Day International and T20 cricket format. Many welcomed his retirement considering his struggle to maintain a consistent performance. Considering how new talent has taken over the team, a good and quick replacement in place of Hafeez shouldn’t be a surprise. 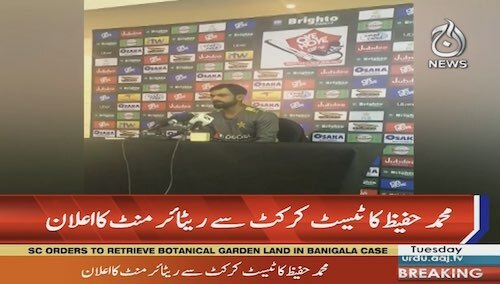 Hafeez will continue to play in ODI and T20. He is also the captain of Lahore Qalandar, the PSL franchise. He will be leading Lahore Qalandar for the first time in PSL as previously he played for other PSL team. 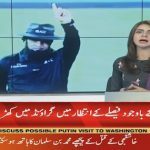 We believe Hafeez will be missed more by South African bowler Steyn, to whom, Hafeez will always be his bunny as Steyn has always been able to take Hafeez’s wicket. Timing couldn’t be more disappointing as Pakistan leave for South Africa right after the series against New Zealand.